I love all things ginger, so Christmas is the perfect excuse to try out some ginger based treats. This ginger syrup is so simple to make, but can be used in so many ways. I like to drizzle mine over porridge or yoghurt, add it to cakes and stir it into a milky coffee to make a fiery gingerbread latte. The syrup also make a great present. Pour into sterilised bottles and tie with a label and cinnamon stick! A quick note, you should try and get the best ground ginger you can. I used Urtekram’s organic ground ginger. It is not such a fine powder as cheaper gingers and it is packed full of spicy flavour. Simply add all the ingredients to a pan and bring to the boil. Reduce the heat and simmer for 10 minutes to allow the flavour to develop. Remove the cinnamon stick and allow to cool. You can now bottle the syrup or use it as you want. Check out the serving suggestions below. I think I have found the perfect measurements for a super creamy soft porridge. I prefer using large oats, which take longer to cook, but retain some texture. 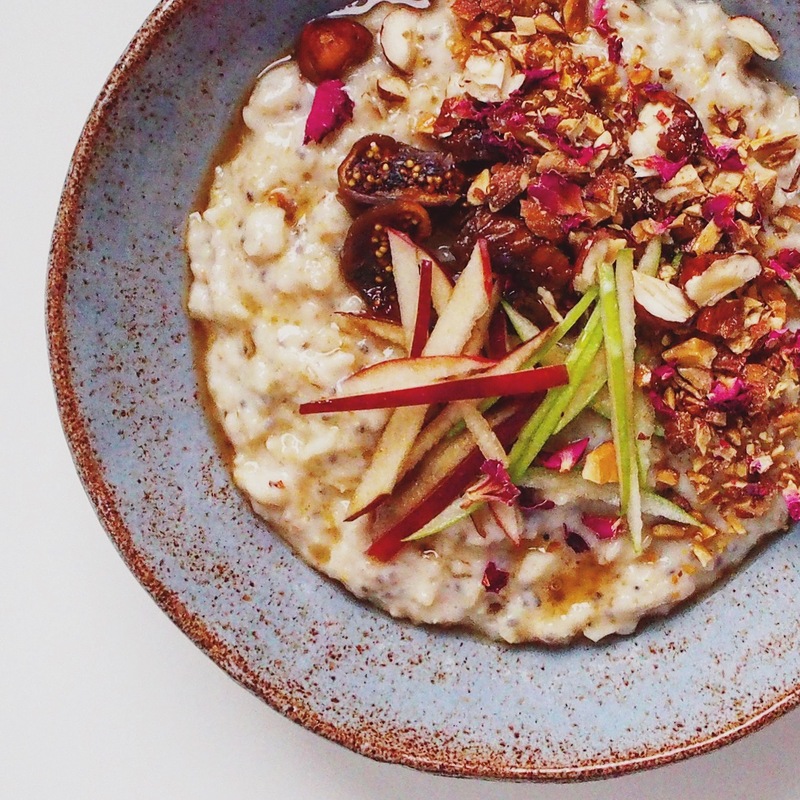 I topped my porridge with sliced apple matchsticks, chopped figs and some toasted almonds. Add the milk and water into a large saucepan and bring to the boil. Add the oats and chia and reduce the heat to a slow simmer. Allow to cook down for 15 – 20 mins, stirring every so often to prevent sticking. Add a little extra water or milk if the porridge becomes to thick. Season with a little salt and spoon into bowls. Top with a drizzle of the gingerbread syrup and any other toppings you fancy. Mix a few teaspoons of the gingerbread syrup into your favourite unsweetened plant based yoghurt. Top with sliced fruit and toasted almonds and oats. Oranges, plums, and mango work particularly well with ginger.